Origin: Orinoco Basin (Venezuela), Rio Las Marinas (Venezuela) and Colombian Llanos. Variants of the species have also been found in Amazon Basin of Brazil. 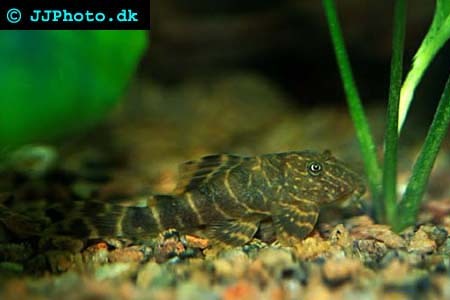 Company: Panaque maccus (Clown Pleco) can be kept in a community aquarium as long as enough hiding places are provided. Aquarium setup: Clown Plecos require large aquariums where each specimen can form their own territory. The aquarium should be decorated so that a lot of hiding places are created among roots and rocks. Plants can be used to create more hiding places. Panaque maccus (Clown Pleco) are territorial and each fish will claim a territory around their favourite cave. This species should always be provided with roots which fills a important function in their diet. Feeding: Clown Plecos prefer vegetables but will accept other sinking foods as a complement to their vegetable diet. Breeding: Unknown. The sexes are virtually impossible to distinguish.